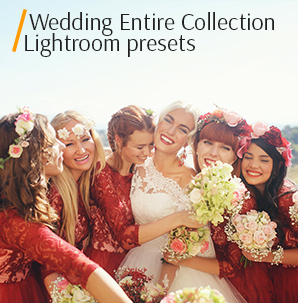 A team of experienced designers has created a free white bokeh overlay collection for wedding photos. There are always lots of lanterns, light bulbs, garlands, candles at wedding ceremonies. All these decorations create an incredibly beautiful glow and glare in photos, adding a special romantic atmosphere. The glow is that white bokeh effect, which looks most appropriate in wedding pictures. But sometimes it is very difficult to capture all this light as a wedding photo session presupposes a large number of shots. But now it is not a problem. You can easily apply the white bokeh background effect by dint of these overlays. 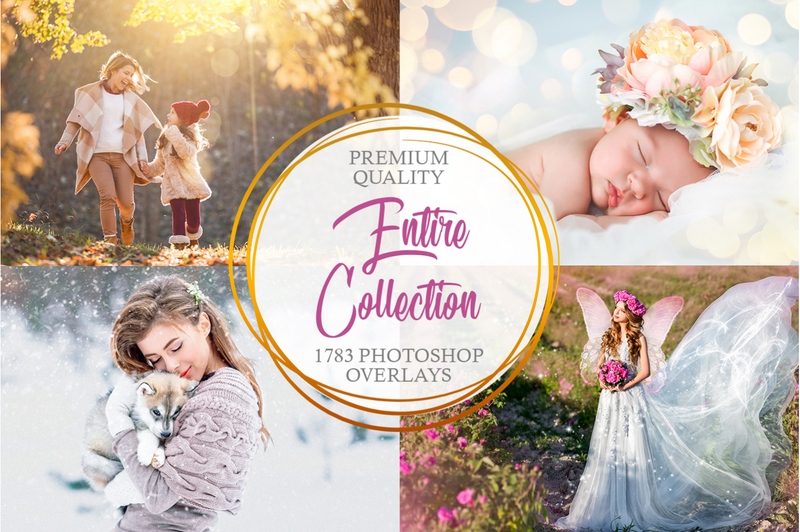 10 professional and high-quality overlays will complement your images enriching it with tenderness and lightness. 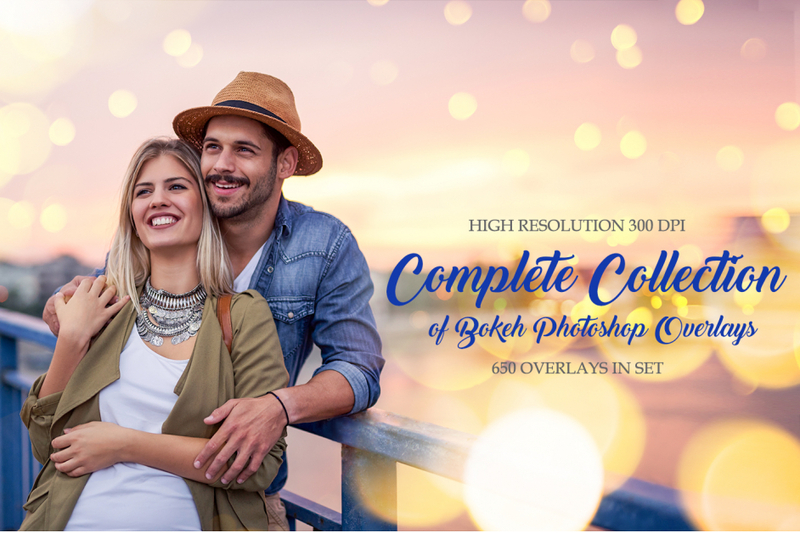 While shooting, you can focus on the couple, but the atmosphere and mood may be created during photo retouching in Photoshop. 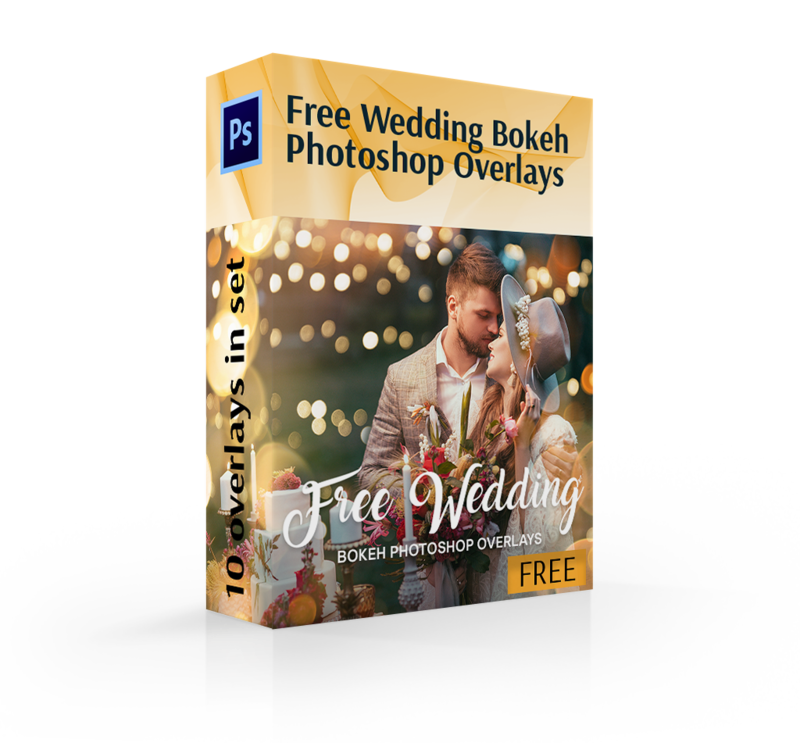 Just download the set of white bokeh PNG overlays, edit the pictures, and add them to the wedding album of your clients. 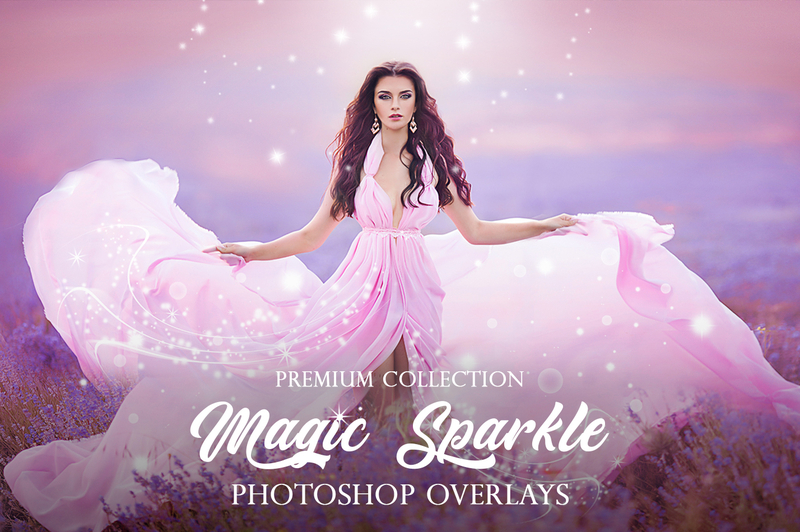 PS Overlay #1 "Romantic Light"
PS Overlay #2 "Gentle Touch"
PS Overlay #3 "Angel’s Glare"
PS Overlay #4 "Warm Glow"
PS Overlay #6 "Shining Miracle"
PS Overlay #7 "White Sparkles"
PS Overlay #8 "Golden Hour"
PS Overlay #9 "White Shimmering"
PS Overlay #10 "Loving Hearts"
If you wish to create a perfect wedding shot, download these white bokeh overlays. This set is specifically designed for wedding photos. 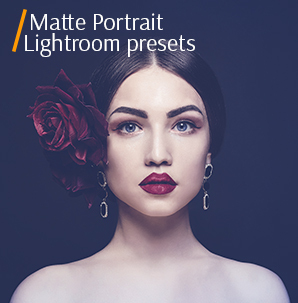 While creating it, we took into account all the peculiarities of such images and created gentle, light white bokeh overlays kit. A great variety of white bokeh overlays. They will look great in the pictures taken outdoors and indoors, in the natural or artificial light. Natural look. Overlays emphasize the light and naturally complement your photos. No one will see that the photos have been edited. The quality. 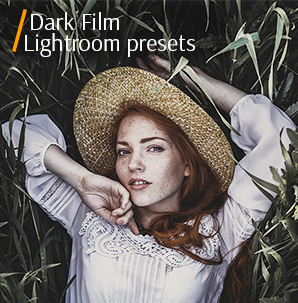 The shot with a bokeh white overlay will look great in both digital and printed form. Free Wedding Bokeh Overlay #1 "Romantic Light"
Try to choose an image with a light source, or a photo taken in bright sunlight. 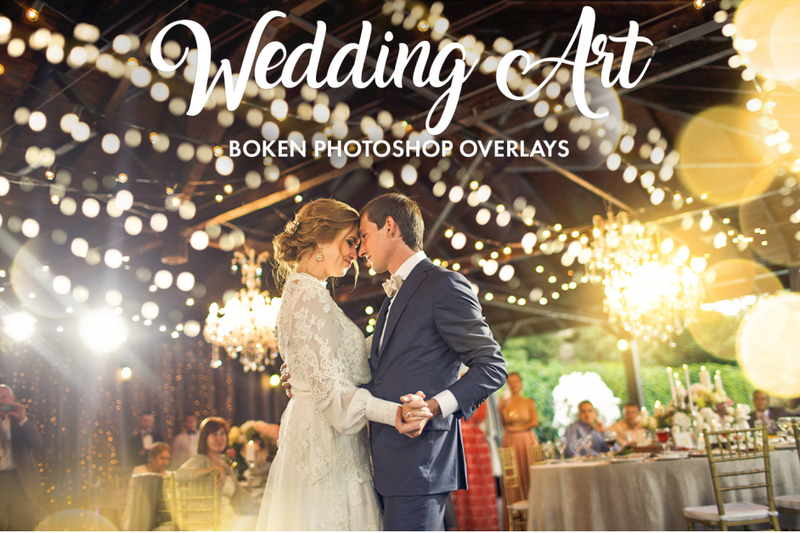 This overlay #1 was taken from "Wedding Art"
The white bokeh overlays make the picture shining and atmospheric. It creates warm romantic charm to emphasize the amazing memories. 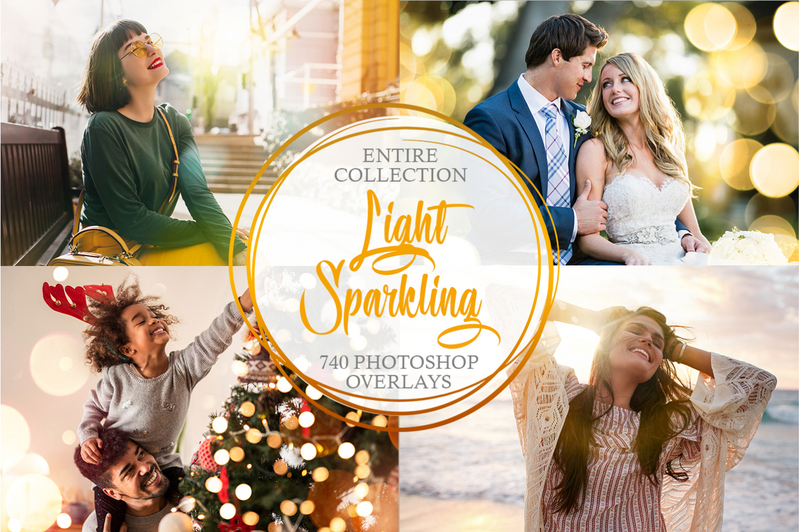 Download these seamless bokeh overlays - they're free. Wedding White Bokeh #2 "Gentle Touch"
White bokeh background isn’t suitable for photos with objects, like rings, bouquet, and other wedding accessories. This overlay #2 was taken from "Wedding Art"
This effect adds bright light of garlands to create an awesome, festive look. Bokeh Overlay #3 "Angle's Glare"
This white bokeh overlay is good for a lifestyle photo. You shouldn’t use it for close-up portraits. This overlay #3 was taken from "Wedding Art"
The overlay adds some bright elements to the background, making it blurred. White Bokeh Effect #4 "Warm Glow"
The white bokeh effect helps focus on the main subject. This overlay #4 was taken from "Wedding Art"
It makes the picture more vivid and adds warm shades. Free Photoshop Overlay #5 "Mysterious"
Looks pretty good in the picture with a dark background. This overlay #5 was taken from "Wedding Art"
The picture acquires more romantic look with the glowing elements added in the lower right corner. Wedding Bokeh Overlay Ps #6 "Shining Miracles"
Use the white bokeh overlay in the photo that has already this effect, just to enhance it. This overlay #6 was taken from "Wedding Art"
The effect helps to draw attention to the center of the photo, making the background blurred. Wedding White Bokeh Overlay #7 "White Sparkles"
This white bokeh overlay is suitable for both color and B&W images. This overlay #7 was taken from "Wedding Art"
It makes the colors in the picture brighter. Wedding Bokeh Overlay #8 "Golden Hour"
It is appropriate for the photographs where the focus is in the foreground and the background is blurred. This overlay #8 was taken from "Wedding Art"
If you wish to fill up your photo with the warm atmosphere and add some sunny glare, apply this white bokeh background overlay. Wedding Bokeh Lights #9 "White Shimmering"
This white bokeh overlay looks stunning in the photos taken at sunset. 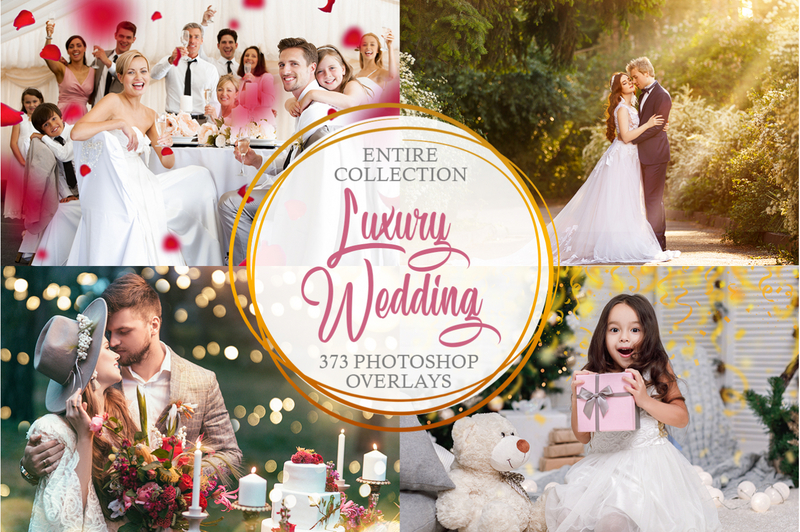 This overlay #9 was taken from "Wedding Art"
It helps showcase and emphasize the festive atmosphere and make the colors brighter. Photoshop Bokeh Overlay #10 "Loving Hearts"
If your image has a white background, adjust the color of the glares. This overlay #10 was taken from "Wedding Art"
This white bokeh effect helps to enhance the natural wedding lights and adds romantic symbols to the photo.